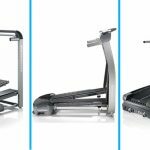 Bowflex TreadClimbers combine the key benefits of a stepper, treadmill, and elliptical into one workout machine. TreadClimbers have gained a lot of popularity in the fitness market. 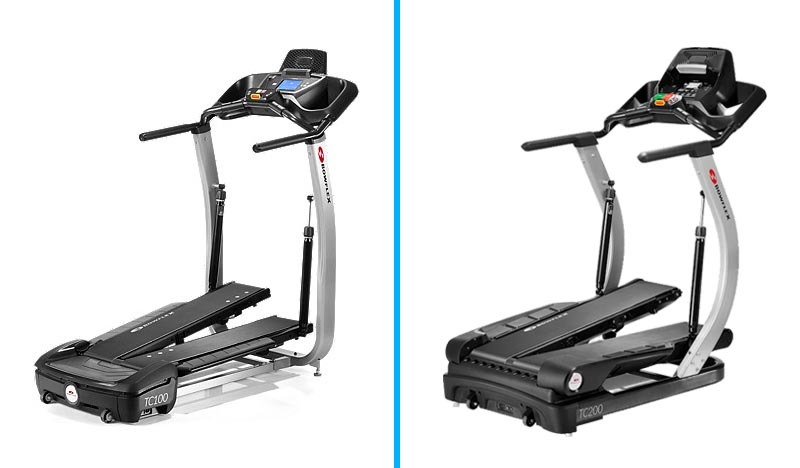 TC100 and TC200 are two popular TreadClimbers in the series. This article compares these two to help you decide which one is the best choice for you. 3 How do you choose between the TC100 and TC200? The belt speed of each product is a determinant of how fast you can go while walking on it. Treadclimbers generally suits the purpose of people that want to do cardio without having to run, so the belt speeds are usually relatively low. The belt speed of TC100 can max out at 4 mph, while the Bowflex TC200 has a belt speed range of 0.5 to 4.5 mph. The TC200 slightly edges the older model out in this category. The levels of resistance in TreadClimbers are basically there to give you the option to set your “difficulty level.” As a beginner, you can work from the lowest levels and gradually work your way up to the harder ones. The number of options that you have will depend on the number of resistance levels available on the product that you are exercising on. The Bowflex TC100 has twelve resistance levels, and the TC200 has the same number. 12 levels is a pretty decent number, and none of our two options here has fallen short. It’s a tie for this category. Exercise equipment such as treadmills, treadclimbers, and elliptical machines usually have a weight limit that should not be exceeded to avoid the risk of damage to the machine. This means that individuals that weigh above the weight capacity of the exercise equipment are not advised to use them, for their own safety and for that of the machine. 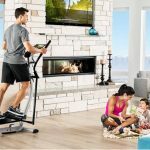 Given this fact, the Bowflex TC100 has a weight capacity of 300 pounds, and this is another category where it ties with the TC200 – also with a weight limit of 300 pounds. No winner here either. Regarding pre-set workout programs, the TC100 is only really equipped with one program – the “Quick Start” that lets you make changes to the belt speed and level of resistance as you work out. More workout programs mean more flexibility and options, and the Bowflex TC200 takes the cake here. Size matters, especially considering ease of storage or transfer of the equipment from one place to another. The two products are not exactly too bulky, so transportation should not be too much of a problem. However, having information about the dimensions of each one could prove to be useful, so here they are. The TC100 has dimensions of 31.5” Width and 57” Length while the TC200 has a width of 31.5” and a length of 55”. This proves that the Bowflex TC100 is slightly bigger than the TC200, although the difference is almost negligible. TC100 allows you to create two user profiles, while the TC200 allows you to create up to four. Each profile that you create will store personal information such as your weight, gender, and age. The stored information is used to improve the accuracy of calculations made for the number of calories that you burn per workout and your maximum heart rate. Additionally, whenever you choose a user profile before beginning a workout, all the information gathered from that session will be logged and can be shared to internet profiles such as MyFitnessPal and BowflexConnect. As of the time of writing, you can get the Bowflex Treadclimber TC100 on Amazon for about $1799 while the TC200 currently goes for $2499. That’s about a $700 difference, so you should definitely put this into consideration if budget is a key factor for you. The consoles on both TreadClimber look similar. Both consoles are backlit and offer similar readouts i.e. Calories, Time, Distance, Speed, etc. However, the console of TC200 has some additional buttons for preset workouts. Another thing most people ignore is that while both consoles have media shelf for placing your book or tablet, the TC200 shelf is relatively wider and also offers better support. Both products have a relatively short warranty. The Bowflex TC100 is covered for two years while the TC200 comes with a three-year warranty. Here’s another category where the Bowflex TC100 loses out. Both warranties are full coverage though. Both machines have included pretty much the same extra features, with the addition of the Goal Coach and the heart rate monitor. However, while the heart rate monitor on the TC100 only functions through touch, the one on the TC200 is a little more sophisticated as it functions through touch and telemetry. The TC200 slightly edges out the TC100 here. The 300-pound weight limit is relatively high, as most average users are likely to fall under it. Twelve levels of resistance are great, to be honest. It is especially good for beginners that are yet to figure out how to fit or how strong they are. They can start small and develop gradually. The quick start option reduces the amount of time that you have to spend fiddling with the console. It does not support wireless heart rate monitoring. A more advanced type of heart rate monitoring is a welcome addition, and the TC200 even comes with a heart rate chest strap! One may require the services of a professional home assembly service, although a well-detailed manual offsets some of the difficulty. The product is bit pricey, and users with limited budgets may have to opt for cheaper options. How do you choose between the TC100 and TC200? You’re looking for the cheaper option. You want to burn up to 2.5X the calories of a treadmill. In conclusion, both TC100 and TC200 are high quality and reliable TreadClimbers. TC200 can be easily considered as an upgraded version of TC100 as it offers additional features such as wireless heart rate monitoring, Bluetooth connectivity, additional workout programs, etc. It is definitely worth the price if you can afford it. However, if your budget is low, then TC100 is a good option.